Today I drilled holes in pots to make olla pots for my garden to water more efficiently. My greenhouse is THIS close to being done, but there is still a hole on one wall up top and today was windy and stormy, so I climbed up and tacked up a piece of plastic to stop the rain from blowing in. While I was perched precariously on the edge of the fence, small nails held between my lips, a hammer balanced in one hand as I held on and attached the plastic there, I saw a honeybee. It was quivering on top of the greenhouse, doing that weird honeybee dance they do, wiggling its back end. I wasn’t sure what it was doing sitting on top of my greenhouse in the wind and periodic rain drips. No other bees were in sight. There were no flowers near it. It looked fragile, there in the wind in the wrong time of year. It was too warm outside for the time of year. Balmy and weird. My raspberries are coming up. The tulips and daffodils are fully bloomed. The cherry trees in my yard are bloomed. My lilies are popping little points up through the soil. Usually in February I spray my fruit trees with dormant spray, but you’re supposed to do it when they’re dormant, and little buds were already present, so no dormant spray. They’re young and I’m sure they’ll be fine, but there aren’t many pollinators out in this bizarre weather, which means likely little fruit this year. This is not normal and not a pattern from the past. Humans have caused this and humans want to ignore it in favor of the latest football scores or whatever else that helps us to ignore the obvious right in front of our faces. It’s like we have a tumor on the side of our head and want to just look around it and pretend it’s not there. The spring rhyme goes, “April showers bring May flowers.” It’s not January showers bring February flowers, and these flowers that are here in March were here in February. We don’t give Valentine’s lilies, we give Easter lilies. At Easter. In actual spring. It isn’t spring in the northern hemisphere where I live. We haven’t had the equinox yet. It is still winter here. So many seem to forget this while infatuated with the sunny weather. This isn’t normal. If your children were in harm’s way, you would try to help them regardless of the outcome because you love them. Shouldn’t it be the same for the Earth, which is us? We are the Earth. We should help her instead of committing slow suicide (though not so slow anymore, it seems). I’m writing this sitting in warm covers in a snuggly bed. I washed all of my bedding today and it smells fresh and clean, and it’s soft and cozy. I’m so grateful to have a warm bed in a warm house, my dogs snoring softly near me as I write. I’m lucky, and I’m grateful for what I have. Sometimes I think our minds just predict what they are going to want in the future and plan accordingly. My brain must have known two weeks ago when it made me buy those dark chocolate caramel balls that none too far in the future, I was going to be weaned off of caffeine, and then the time was going to change, and I would be sitting forlornly in my office wishing I could just go get a jug of coffee and bathe in it. 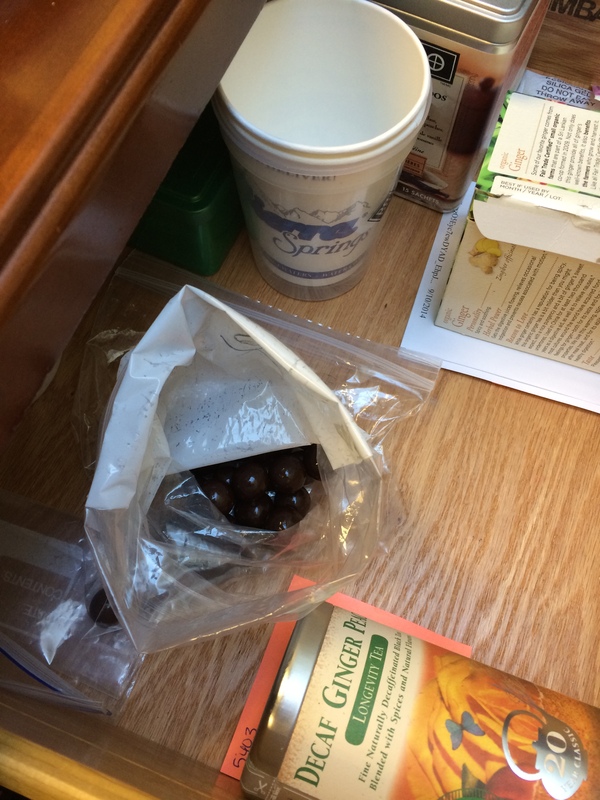 It would know that I would not remember those dark chocolate caramel balls sitting in my drawer. It knew I would open the drawer for some other reason (like to get a cup of herbal, non-caffeinated tea to sort of pretend the warm beverage was caffeinated) and discover, lo and behold! A small baggy of drugs, er, dark chocolate caramel balls and I would just melt with pleasure. Yes, brain. I thank you. You’ve done me right on this one.